It was about 12,000 or fewer years ago that, with the spread of forests and a great change of the fauna, the long prevalence of the hunting life in Europe drew to its end. Reindeer vanished. Changing conditions frequently bring with them new diseases. There may have been prehistoric pestilences. For many centuries there may have been no men in Britain or Central Europe (Wright). For a time there were in Southern Europe drifting communities of some little known people who are called the Azilians. They may have been transition generations; they may have been a different race. We do not know. Some authorities incline to the view that the Azilians were the first wave of a race which, as we shall see later, has played a great part in populating Europe, the dark-white or Mediterranean or Iberian race. 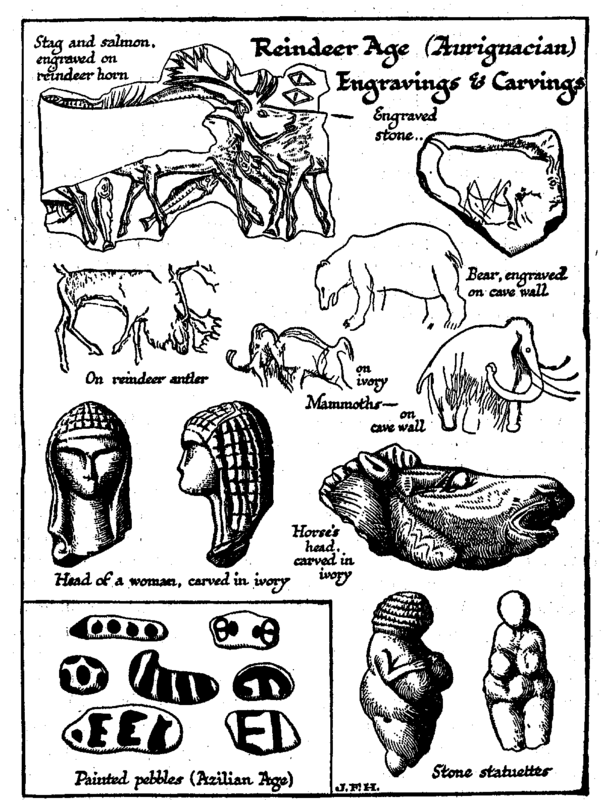 These Azilian people have left behind them a multitude of pebbles, roughly daubed with markings of an unknown purport (see Figure 73: Reindeer Age Engravings and Carvings). The use or significance of these Azilian pebbles is still a profound mystery. Was this some sort of token writing? Were they counters in some game? Did the Azilians play with these pebbles or tell a story with them, as imaginative children will do with bits, of wood and, stone nowadays? At present we are unable to cope with any of these questions. We will not deal here with the other various peoples who left their scanty traces in the world during the close of the New Paleolithic period, the spread of the forests where formerly there had been steppes, and the wane of the hunters, some 10,000 or 12,000 years ago. We will go on to describe the new sort of human community that was now spreading over the northern hemisphere, whose appearance marks what is called the Neolithic Age. The map of the world was assuming something like its present outlines; the landscape and the flora and fauna were taking on their existing characteristics. The prevailing animals in the spreading woods of Europe were the royal stag, the great ox, and the bison; the mammoth and the musk ox had gone. The great ox, or aurochs, is now extinct, but it survived in the German forests up to the time of the Roman Empire. It was never domesticated. It stood eleven feet high at the shoulder, as high as an elephant. There were still lions in the Balkan Peninsula, and they remained there until about 1,000 or 1,200 B.C. The lions of Wurttemberg and South Germany in those days were twice the size of the modern lion. South Russia and Central Asia were thickly wooded then, and there were elephants in Mesopotamia and Syria, and a fauna in Algeria that was tropical African in character. Hitherto men in Europe had never gone farther north than the Baltic Sea or the British Isles, but now the Scandinavian Peninsula and perhaps Great Russia were becoming possible regions for human occupation. There are no Paleolithic remains in Sweden or Norway. Man, when he entered these countries, was apparently already at the Neolithic stage of social development. From the cave at Mas d’Azil. But our domestic cattle are derived from some form of aurochs — probably from some lesser Central Asiatic Variety. —H. H. J.